Power Transmission Lines & Towers Market size in 2017 was over USD 30 Billion and is predicted to witness growth of over 1% by 2024. 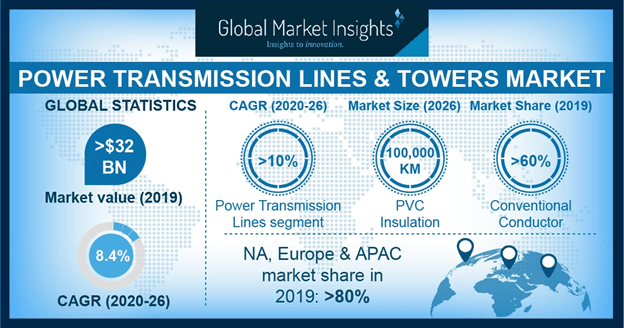 Global power transmission lines & towers market is set to grow owing to stringent energy efficiency protocol favoured by expeditious integration of digitalized electrical components. Ongoing technological progression with an aim to circumvent electrical & mechanical losses across a network will positively influence the industry landscape. In addition, the industry is strongly being driven by the modernization and revamping of the existing grid infrastructure across developed regions. Increasing peak load demand across the developing economies has been imposing concerns in line with grid stability and security of supply. Rising investments to establish a sustainable electrical network coupled with favourable regulatory reforms pertaining to the integration of grid integration of renewable systems will foster the market size. Furthermore, the proposed concept of national grid mechanism along with the expansion of grids across international borders positively influence the business landscape. Power transmission lines are predicted to grow over 1.5% by 2024. Growing demand for energy along with favorable regulatory reforms adjoining the expansion of smart grid networks will positively influence the business outlook. In addition, appreciable increase in cross border grid investments along with ongoing integration of sustainable energy networks across developing economies will proliferate the industry dynamics. Ongoing expansion of electric grid infrastructure along with positive consumer tendencies towards the integration of smart artificial intelligence systems will escalate the power transmission towers industry growth. Paradigm shift toward IT implementation across the power industry will substantially enhance smart grid expansion, which in turn will augment the demand for effective transmission towers. In addition, modernization of the grid networks to make it “smarter” and furthermore resilient through the integration of cutting-edge equipment, technologies, and controls will complement the business outlook. Conventional conductors in 2017, accounted for over 50% share of the global power transmission lines market share. Lower expansion coefficient, effective conductivity and tensile strength are few imperative parameters driving the product adoption. In addition, rapid technological enhancements coupled with availability of a wide product portfolio at competitive prices further augment the product demand. PVC insulation is set to exceed an annual installation of 29 ‘000 ckt km by 2024. Effective fire retardation, mechanical strength, light weight, and abrasion resistance are few indispensable features driving the product adoption. In addition, ease of recycling and processing when compared to auxiliary thermoplastic & thermoset technologies further strengthen the industry potential. 132 kV to 220 kV power transmission lines & towers market is estimated to gain over 1% by 2024. Rapid commercial expansion and urbanization along with ongoing deployment of high tension electric networks will boost the industry landscape. Ongoing fabrication of manufacturing facilities across developing nations along with expansion of utility aided grid infrastructure will further augment the business outlook. Expansion of extra (EHT) & ultra-high-tension (UHT) grid infrastructure to curb the accumulated line losses will drive the HVDC power transmission lines & towers market headway. Effective asynchronous interconnection, negligible short-circuit current, lower losses, and enhanced controllability pose immense potential for these networks in the near future. High tension (HT) power transmission lines & towers market are anticipated to grow over 1% by 2024. Rapid industrial expansion along with favorable reforms supporting the revamp and refurbishment of existing grid networks will foster the industry growth. In addition, significant technological enhancements coupled with positive inclination towards energy efficiency will further complement the industry outlook. 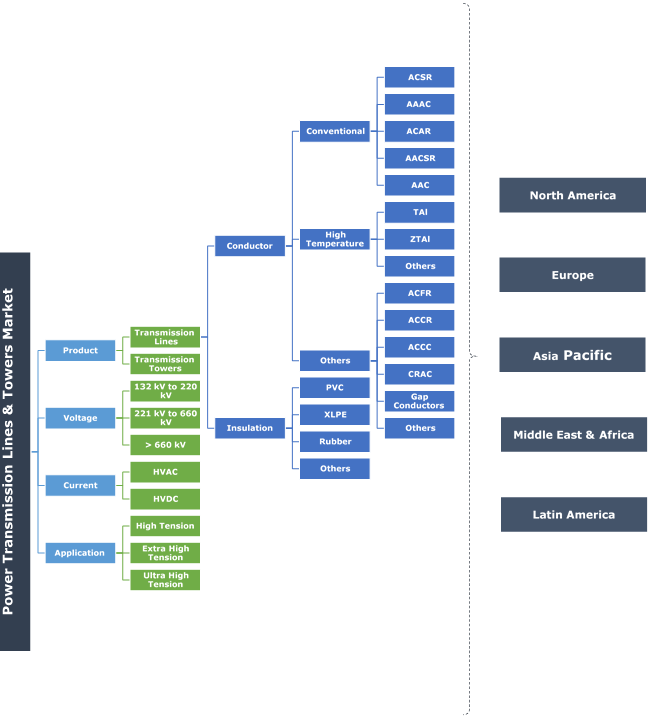 The U.S. power transmission lines & towers market subject to the retrofitting & revamping of the grid infrastructure has infused a favorable industrial scenario. Integration of an enhanced grid support mechanism along with ongoing technological advancements will augment the business growth. In addition, rising infrastructural investments coupled with rising energy consumption will further drive the industry landscape. The Europe power transmission lines & towers market will gain escalation in line with stringent energy efficiency concord coupled with rising renewable electricity share across the region. Regulators have effectively been channelizing investments with an aim to reinforce their electricity transmission and distribution infrastructure. Integrated regional framework to fortify the EU’s policy include, streamlining of fund flow towards an adaptable and stable grid through the incentivizing of energy efficient equipment and consumer goods. Prominent players across the power transmission lines & towers market include Siemens, ABB, GE, EMC, K-Line, ICOMM, CG, KEC, Aurecon, Arteche, Mastec, Sterling & Wilson, Skipper, General Cable, ShanDong DingChang, Kalpataru, Nanjing Daji, Prysmian, Zhejiang Shengda, Sumitomo, Southwire Company, and Nexans. Inorganic growth manifestation coupled with extensive fund flow towards technology-based R&D to develop energy efficient & economic units have been the key strategies integrated by the leading industry players. Electric power transmission is the supply of electrical energy from generation site to substation. The network comprises of circuit breakers, transformers, insulators, arrestors, circuit breakers, towers and similar components. These components protect, facilitate, conduct, and transform, electricity across the transmission networks.